The mercenary Terror, whose body is composed of parts from various corpses that he has incorporated into himself, visits an occult expert named Rekrab whose collection includes a lacquered puzzle box. The puzzle box is a Lament Configuration from the Hellraiser film series, based on Clive Barker’s story “The Hellbound Heart.” “Rekrab” is Barker spelled backwards. 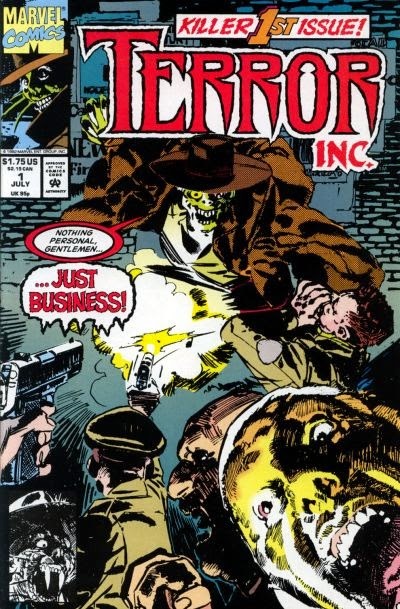 Terror was originally known as Shreck, a character in Marvel’s Shadowline imprint, which took place in an alternate reality to the mainstream Marvel Universe. He later immigrated to the reality where most of Marvel’s heroes operate, encountering Wolverine and other heroes. It can be presumed that the Terror of the CU has a substantially different history. I hope the writer did not intend this but Rekrab is a slur against homosexuals. I did not know it was a slur until I did a search to see if Rekrab was a real name. D.G. Chichester, who also wrote a few issues of Marvel's Hellraiser series, including the Nightbreed crossover whose covers I posted here not long ago. Well, given he worked on a Hellraiser series it's probably a tip of the hat that had an unintended meaning.